Pope Francis made the Cover of Rolling Stone Magazine. ROLLING STONE! Rolling Stone Magazine was founded in San Francisco in 1967 and initially identified with and reported on the hippie counterculture of the era. The magazine now focuses on popular culture and has shifted its aim to a younger readership interested in youth-oriented television shows, film actors, and popular music. 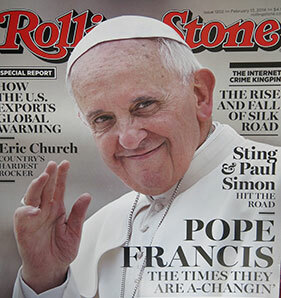 Pope Francis is on the cover of Rolling Stone because he is fulfilling his assignment. An assignment is an appointment, a post and a position, a duty and a designation, an onus and an obligation. And this magnate of a spiritual man is fulfilling every aspect of his assignment. So for this popular, pop culture magazine to take note and have the head of the largest church in the world on its cover is a really big deal. Really big. Big, Big. Big, big, big. 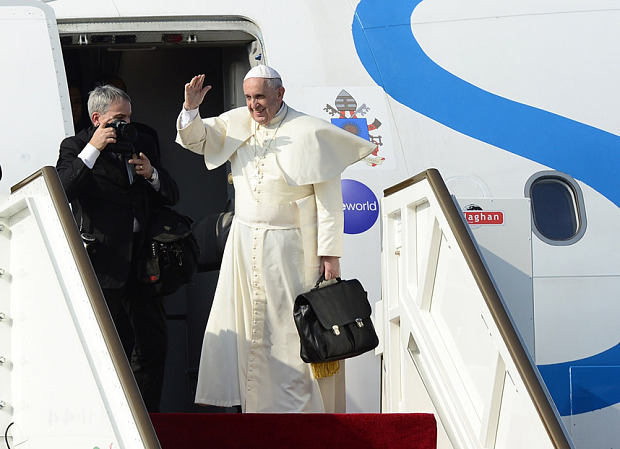 Pope Francis is on his first visit to North America and the US is the center of his assigned destination. His visit is turning heads and making headlines all over the world. On this trip, the Pope first visited Cuba, where not too long ago this island country was considered a crucial communist outpost in the Western Hemisphere. The Pope then traveled to Washington, DC where he met with President Obama and then addressed a joint session of Congress. This appointment with the legislative leadership of the US marked the first time the head of the world’s Roman Catholics addressed Congress. Pope Francis then hopped to New York where he painted the town red. He addressed the annual United Nations General Assembly of world leaders, as well as being a one man parade down 5th Avenue. Francis was treated like an All Pro rock star as he conducted mass at Madison Square Garden, home of the Knicks and the Rangers, and numerous rock concerts. He also held mass at St. Patrick’s Cathedral, where he paused to bless a young girl in a wheelchair and then got a standing ovation when he reached out to a group that has at times felt marginalized — the nuns who serve the church. To the religious women of the United States,” Francis said in his native Spanish. “What would the church be without you. 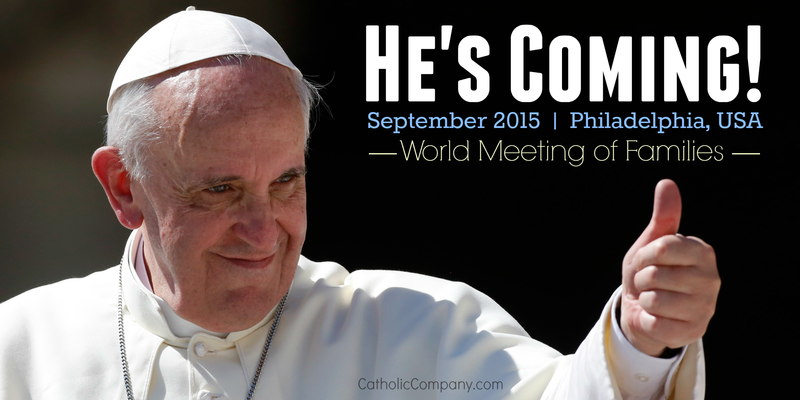 The Papal visit is now in Philly where he is addressing the World Meeting of Families. What a whirlwind tour. Pope Francis is 78 years old. He’s been called the “People’s Pope.” He’s down to earth, friendly, and downright fatherly. He is truly a holy, humble man. When he can, he carries his own bag, for Pete’s sake. The Pope is called the Holy Father because he is recognized by many to be the Father of church, and the church is a family of families. A father’s mandate, mission and motive centers on and circles around the care and comfort of his children. The children of a father are his utmost concern. And you don’t have to be catholic or even religions to see and understand that this Pope, this father, is fulfilling this assignment. In football, a blocking guard is assigned to block. In basketball, a shooting guard is assigned to shoot. And in life, a spiritual guard is assigned to protect and defend. That’s the assignment of a father. So fathers, protestant and catholic alike, are you fulfilling your assignment? Teaching your kids how to catch and teaching your little girl how to be a lady and teaching “Jr” how to be a man is all a part of your assignment. Jesus fulfilled his assignment. He gave His life for us. He died for us. He shed His blood for us. Likewise, Pope Francis is fulfilling his assignment.